Paul & Joe will be releasing a veritable treasure trove of nail polishes this Christmas! Wonderful news for all us nail fanatics, we’re really being spoiled for choice at the moment! I’m particularly loving the red and black shades… knowing P&J, the pink and white will be sheers (and therefore not for me!). The gold is a sparkly addition and surely a staple for every Christmas collection, but most importantly they’ve out-cuted the competition once again with those pretty little bottles. 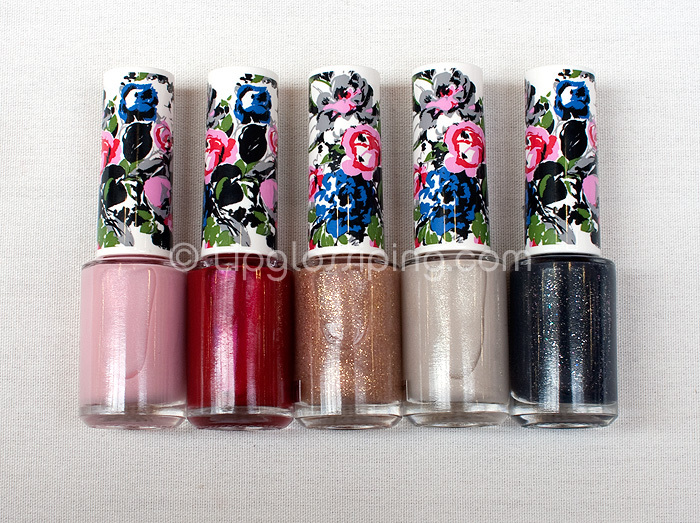 For a sneak peek at the rest of the collection, head over to BritishBeautyBlogger who has the low-down. love the gold and the packaging is so cute! I can’t wear gold that successfully, but I’m sold on the packaging too! hideous packaging, and uninspiring colours. sigh. High five, P&J know they’re packaging design for sure! Now I love both the colours and the packaging *sigh* I love nail varnish, but tend to look at it in the bottles rather than put it on the nails which rather defeats the object! No, no! You must wear copious amounts of nail polish. I’ve only really got into polish in the last 18 months. I adore it for it’s (relatively) inexpensive quality. It’s a real immediate gratification type product. Love the packaging, but it’s not very christmassy is it! Actually, you’re right… it’s a bit Spring-like isn’t it?! The red and black ones look beautiful! And the bottles are so cute too.